Located in the quiet green area, in a marvelous park with Malta Lake, the Novotel Poznan Malta ***, has been completely renovated to offer guests the most modern comforts and up to date facilities. 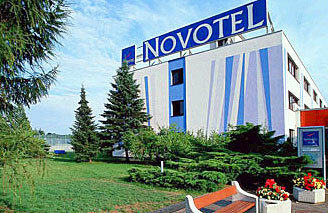 The hotel is only 2,5 km away from the city centre of Poznan. Proximity to the Berlin - Warsaw motorway (E30) assures the easy access. Close by guests will find excellent recreation and waking areas to spend their leisure time in contact with nature. In the hotel you can rent a bicycle to ride through the beautiful green neighborhood. The Novotel Malta features 149 double or single rooms with a splendid view of the Park and Malta lake. The rooms are equipped with TV SAT (including CNN), Pay TV, radio, direct-dial telephone, fridge and Internet access. Non-smoking rooms and rooms for the disabled are also offered. In the completely renovated restaurant The Garden Brasserie guests will taste traditional cuisine of the region as well as delicious International dishes. Vegetarian and dietary food are also available. Guests will start a day with rich buffet breakfast. Room service is available from 12 a.m. to 10 p.m. . 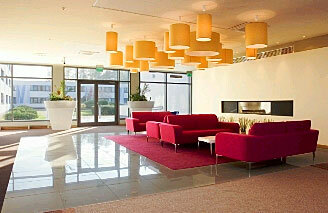 Guests can relax in a modern bar or in comfortable lobby with a fire place. 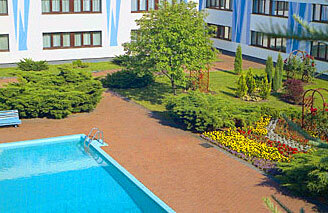 The guests may spend their leisure-time at the outdoor swimming pool, tennis court or cycling. Children can play in the hotel’s playground. 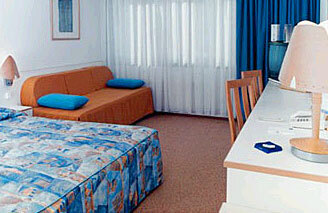 The hotel offers 3 multi-function rooms able to accommodate up to 250 people. Amenities to guests include a business centre, a beauty parlor, a hairdresser, a car park, in front of the hotel mini fitness studio, facilities for the disabled, safe deposit box at the reception, security and fire protection systems, laundry service. At the reception guest can rent an iron and hair dryer. Guests can use the printer, fax and computer. The Hotel is situated 2,5 km from the city centre. The airport is 15 km and the railway station is 5 km away from the hotel. The fair grounds are 5 km away.